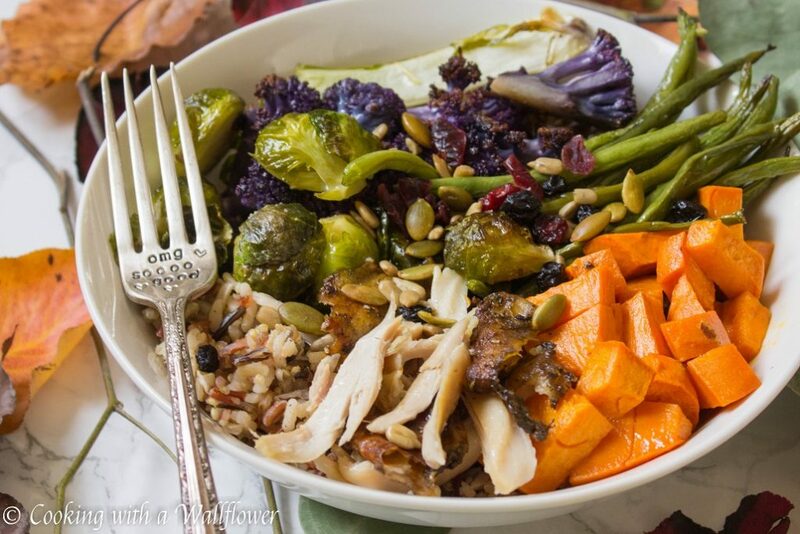 Mixed grains topped with leftover turkey and roasted vegetables then drizzled with maple balsamic vinaigrette. 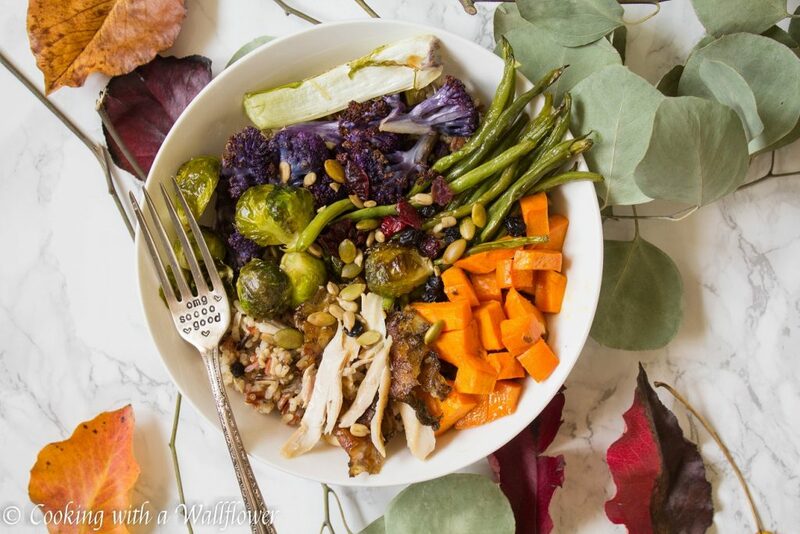 This roasted leftover turkey vegetable grain bowl is the perfect way to use up your leftover turkey. 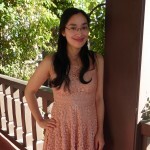 I hope you guys had a fantastic Thanksgiving day with your family and friends! We had so much food as usual and now we’re going to be eating leftovers for days to come. So I thought we could have a little fun with our leftovers. Just the other day, I shared with you this Leftover Turkey Vegetable Chili, which is seriously perfect for chilly days when autumn is transitioning to winter. 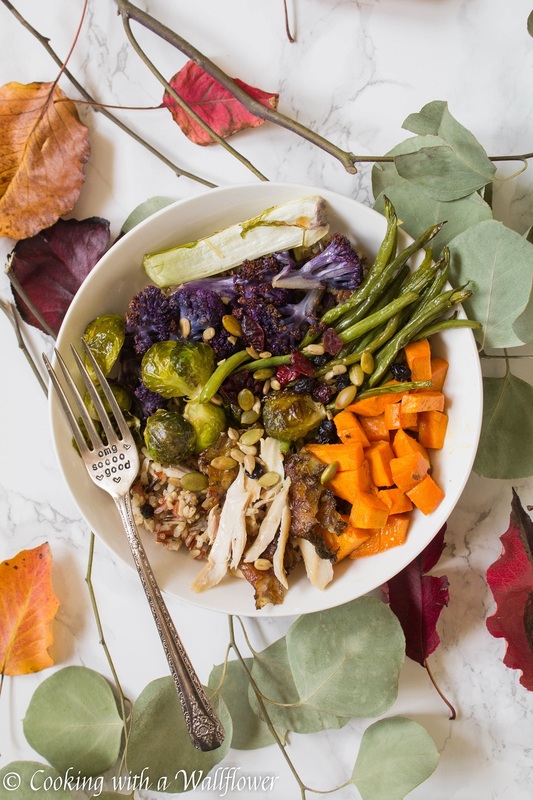 But if you’re in the mood for vegetables, this roasted leftover turkey vegetable grain bowl might be what you’re searching for. As much as I love our Thanksgiving Day feast, the days after I’m usually craving for something more vegetable oriented. So to make things simple, just gather all the vegetables you might have waiting to be used. Leftover brussels sprouts? Check. Yam or sweet potato? Check. Green beans or haricot vert? Check. And I may have picked up a purple cauliflower from the farmer’s market last Sunday. I could not resist the vibrant purple color. But it doesn’t matter what vegetables you use. Just use whatever you have. 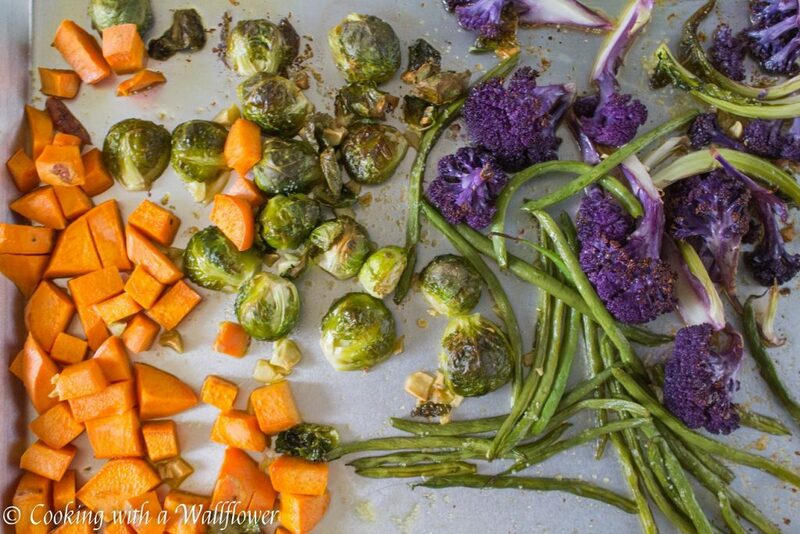 Spread your prepared veggies on a baking sheet. Drizzle olive oil all over the vegetables. Season with salt. Then roast for about 25 minutes until the vegetables are tender and slightly charred. 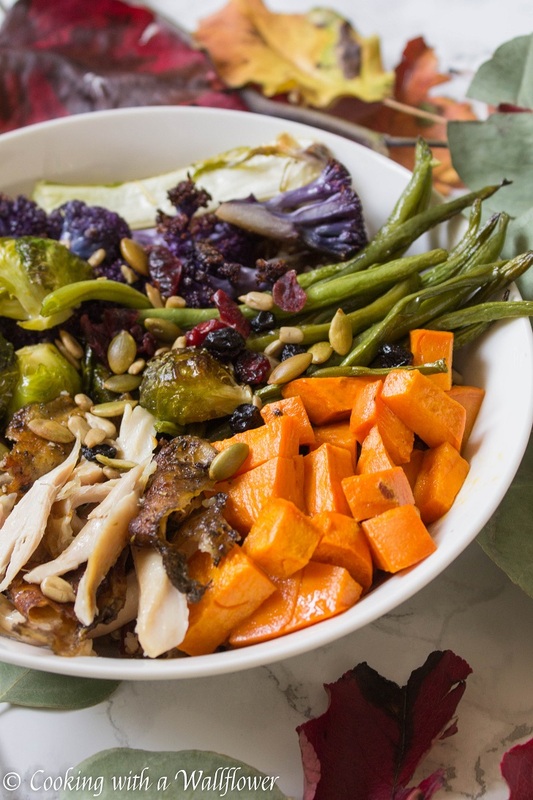 You can serve these veggies over your favorite grains and leftover turkey or ham or chicken. 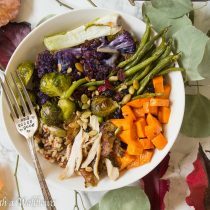 For additional flavor, you can serve this roasted leftover turkey vegetable grain bowl with a drizzle of maple balsamic vinaigrette. It’s my favorite dressing for fall. Hope you’ll enjoy this dish! By the way, did you go Black Friday shopping? If you did, what did you get? Preheat the oven to 400F. Lightly grease the baking sheet with nonstick cooking spray or olive oil. 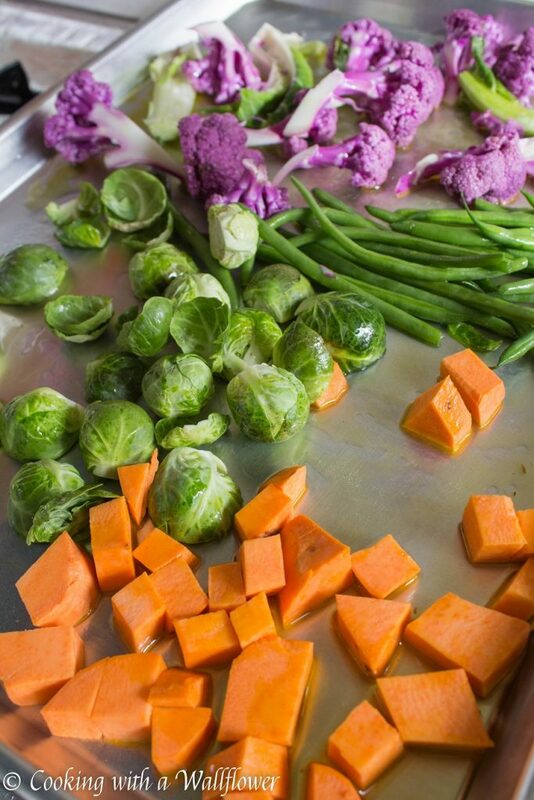 Spread the vegetables onto the baking sheet in a single layer, and add minced garlic. Drizzle olive oil over the vegetables and season with salt. Roast the vegetables in the oven for about 25-30 minutes until the vegetables are tender and charred. 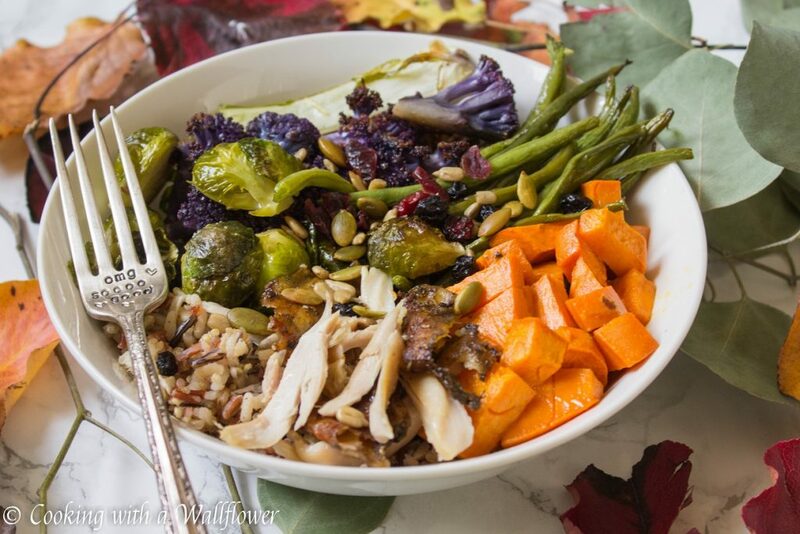 Serve the mixed grains topped with roasted vegetables and leftover turkey. Drizzle with maple balsamic vinaigrette. To make the maple balsamic vinaigrette, whisk together maple syrup, balsamic vinegar, and olive oil. This entry was posted in Entree, Fall Cravings, Farmer's Market, Gluten Free, Holidays, Quick and Easy, Recipes and tagged fall recipes, farmer's market, gluten free, quick and easy, Thanksgiving, Thanksgiving leftovers, turkey. This looks like a healthy after Thanksgiving meal!! 🙂 Thanks for sharing with us at Fiesta Friday! Such a colorful vegetable bowl. I am just wondering what else I might use your Maple Balsamic Vinaigrette with. Happy Fiesta Friday. The dressing sounds amazing! I was surprised at the few number of ingredients. It makes me think about pork chops. That purple cauliflower is eye-catching!